If it’s one thing that’s associated with AMG other than big, lairy powerslides, it’s noise. Wonderful, barrel-chested bass noise. The sort of sound that takes control of your head and heart, making you pull your happy face right in front of anyone you’re with. It’s something that the A45 has never had in the same way as its larger brethren because it’s an inline-four. 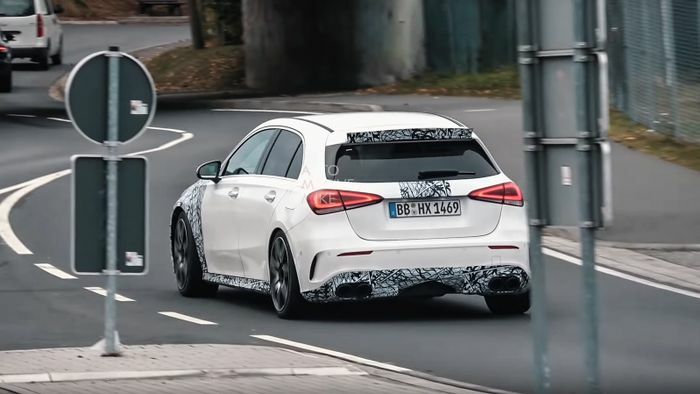 The new one has been caught in testing at Germany’s Nurburgring and it doesn’t seem to have found a solution yet – although we’ve got caveats to cover, here. 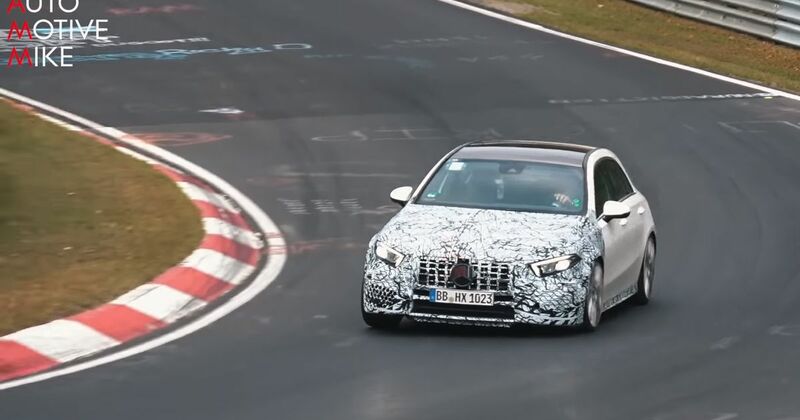 Automotive Mike’s video opens with the car spied on the road, travelling a short distance near the famous Green Hell. There’s a pleasant growl as it pulls away through the automated gearbox, and then the exhaust pops and crackles away like a charcoal barbecue the size of the Death Star. Barely any throttle has been used so it’s obviously engineered to exaggerate. 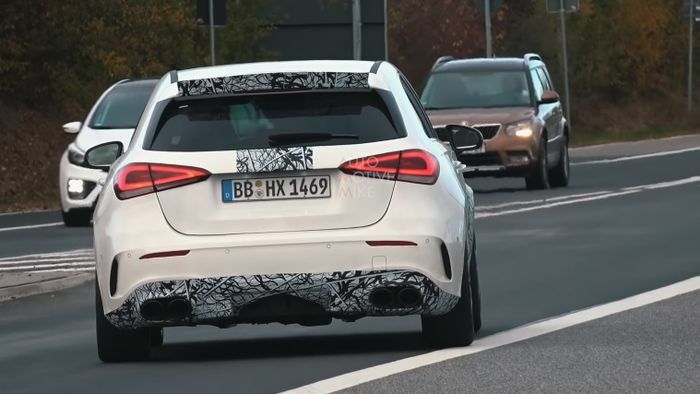 The Hyundai i30 N does much the same thing. But on track the car barely seems to make a whisper as tyre squeal kills what exhaust character there is. At one point what looks like a 992 Porsche 911 pops up behind the A45, and its exhaust note is clear as a bell, so it’s not simply the poor-quality microphone used to record the sound here. To be fair, the A45 will almost certainly have selectable drive modes, some of which will be quieter than others. Perhaps these runs were carried out in the least aggressive mode of the bunch. Perhaps development on the fist-test-friendly quad-outlet exhaust isn’t finished yet. Elsewhere on the car, the front wings may be camouflaged but we can see their extra flare. The lower part of the rear bumper will be a diffuser of as-yet unknown effectiveness, and the new body kit includes a roof spoiler and side skirts. The overall effect is probably less in-your-face than the production version will be. Series production is slated for 2019.